Since the weather has cooled, it was only natural that I wanted some stick-to-your-ribs kinda meal AND I don’t mind having the warm stove or oven on. Yay! That was now settled, so I grabbed my apron, cranked up 95.9 The Ranch on the kitchen radio and started frying up some goodness! 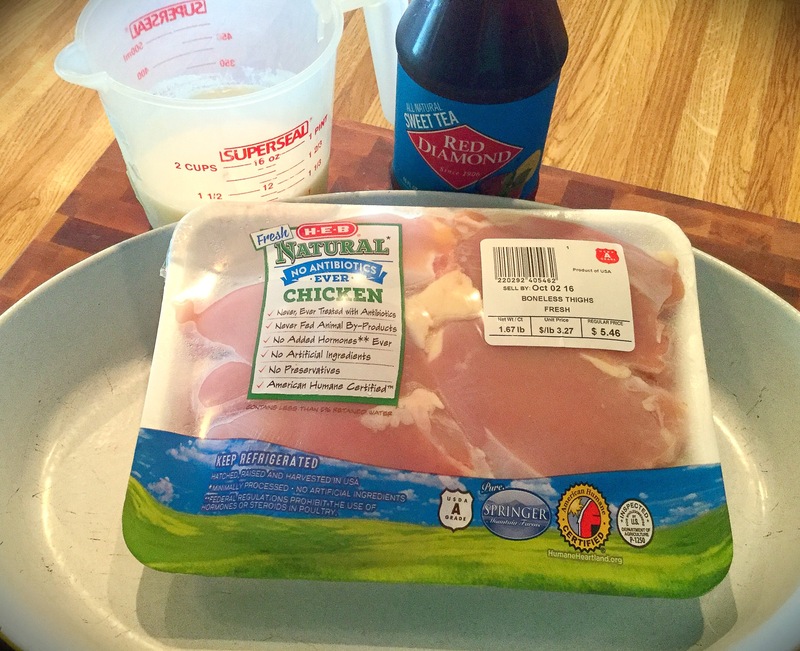 Earlier in the day, add the chicken thighs to a ziplock bag and pour in the buttermilk and sweet tea. Zip up and give a shake to evenly distribute the brine. 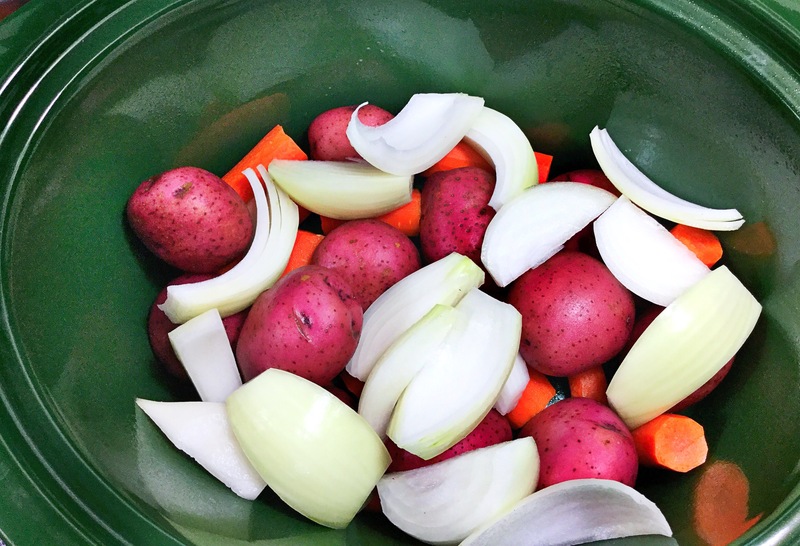 Store in a shallow dish (to avoid spillage) and place in the refrigerator for 2-6 hours (overnight is fine too). Once you’re ready to fry these up, bring about 2″ of oil up to med-high heat. (350-375 degrees) in a heavy bottomed skillet or dutch oven. 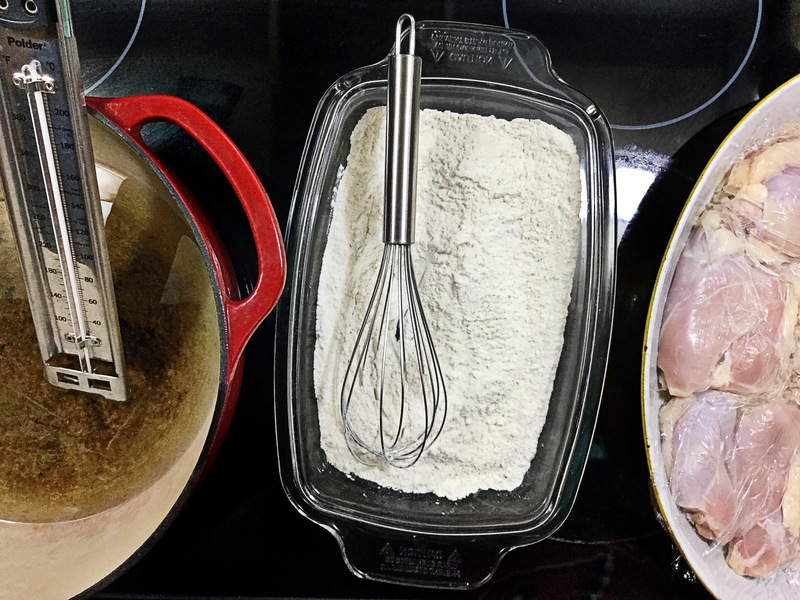 Next, in a shallow dish, whisk together the flour with the spices and remove the chicken from the refridgerator. 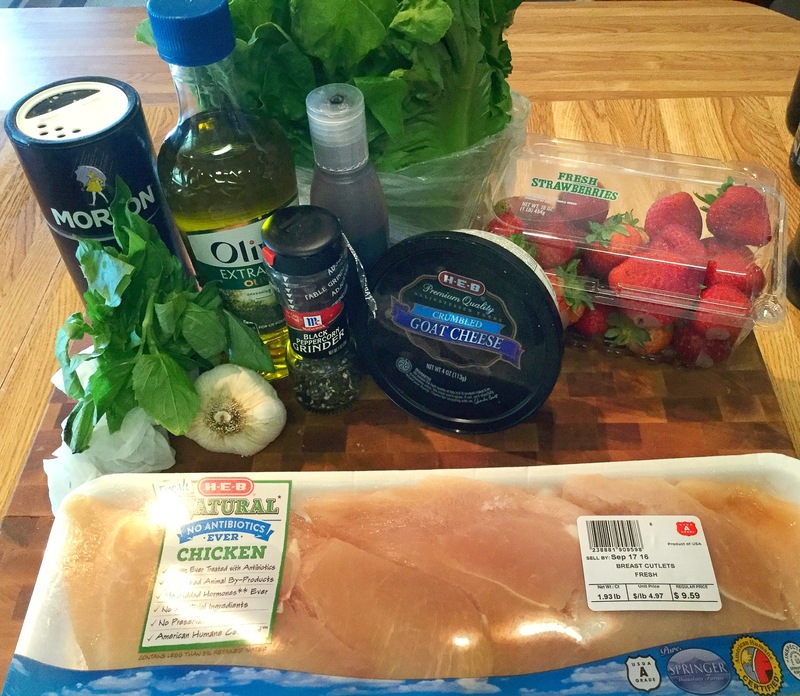 *Here, as I often do, is place the chicken thighs between two sheets of plastic wrap and pound out a bit thinner. Helps to tenderize it even more AND it looks kind of cool hanging over the bun. Bigger is always better ;). Now we’re ready to fry! 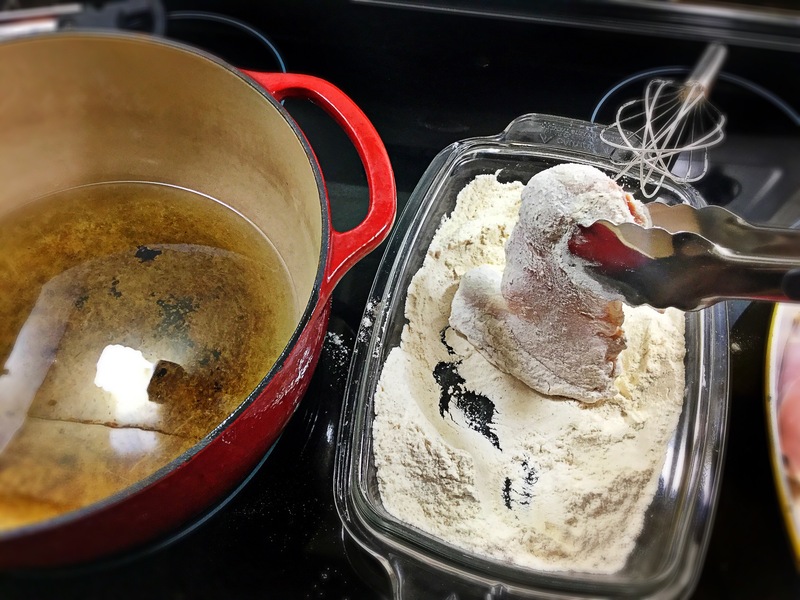 Using tongs, grab one of the chicken thighs and shake off excess brine, then dredge completely with the seasoned flour. Transfer to the hot oil and allow to cook for 6-8 minutes, then turn over and fry for another 6-8 minutes (till golden brown and cooked through). Remove to wire racked baking sheet (or paper towels) to rest while you finish the remaining thighs. *Only fry 2-3 at a time so that the oil temperature doesn’t drop…THAT makes for greasy chicken! 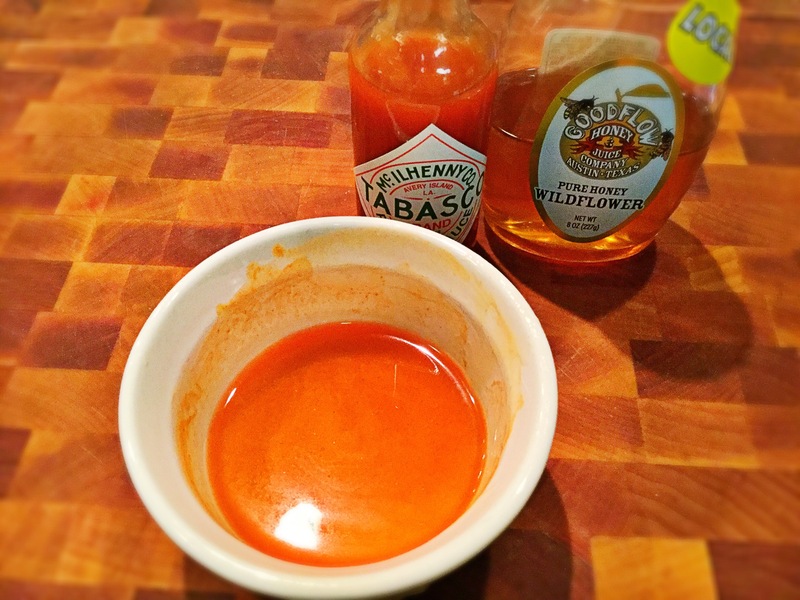 Now that the chicken is cooked, whisk together the honey and Tabasco sauce to taste. You also can slightly toast the cut side of the sliders on a hot skillet if desired (not toaster oven). Assembly time!! 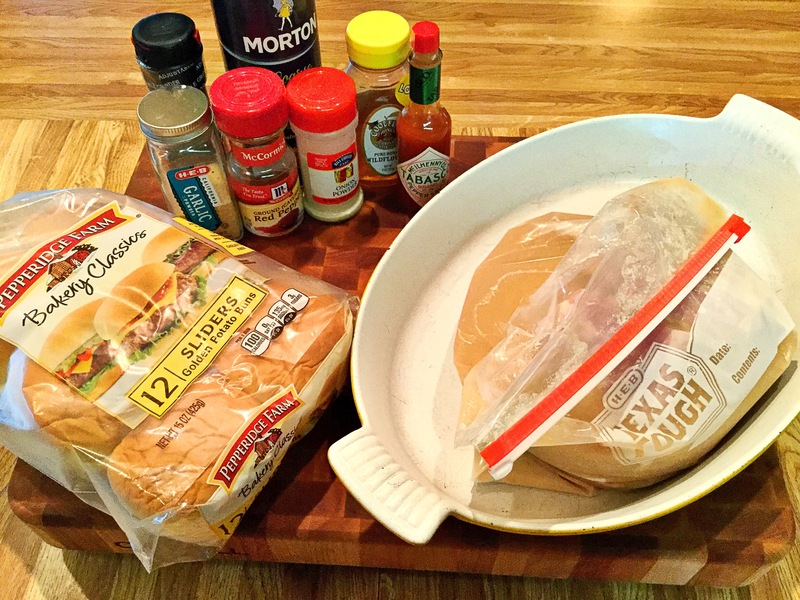 Spread a thin (or thick) layer of mayonnaise on each side of your soft slider rolls. 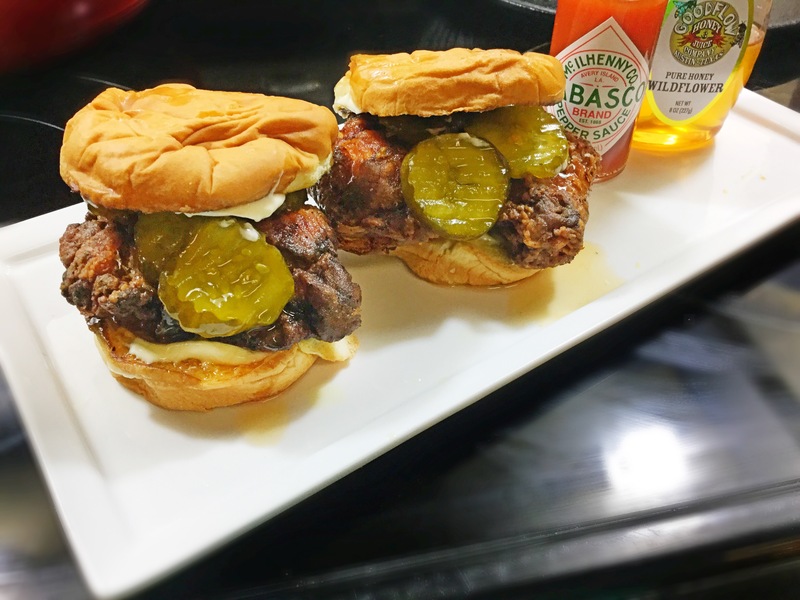 Then add the fried chicken, followed by a few bread & butter pickles and finally drizzle the honey-Tabasco right over top! Dig in and enjoy!! Crunchy and spicy..and healthy! As usual, I was craving some tasty Mexican food, but just didnt want the heaviness that goes along with cheesy enchiladas, super burritos or chimichangas. 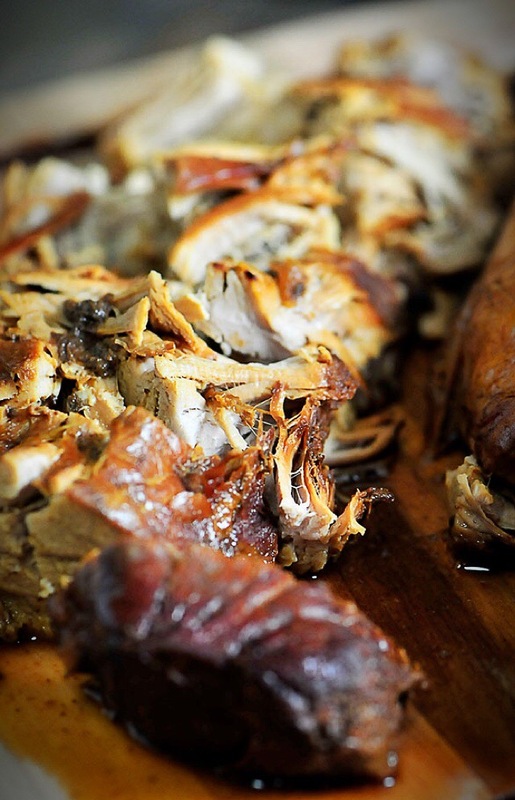 I also didnt have the time to braise a big hunk of meat or use my slow-cooker for a yummy shredded filling. *To keep with the light & healthy meal, I made a quick Mexican Fruit Salad to go along with it. Simply cut up some cantaloupe and honey dew melon. Dust on a bit of chili powder and kosher salt, then topped with a dollop of vanilla greek yogurt, a squeeze of fresh lime juice and its zest! Yummmm…promise! 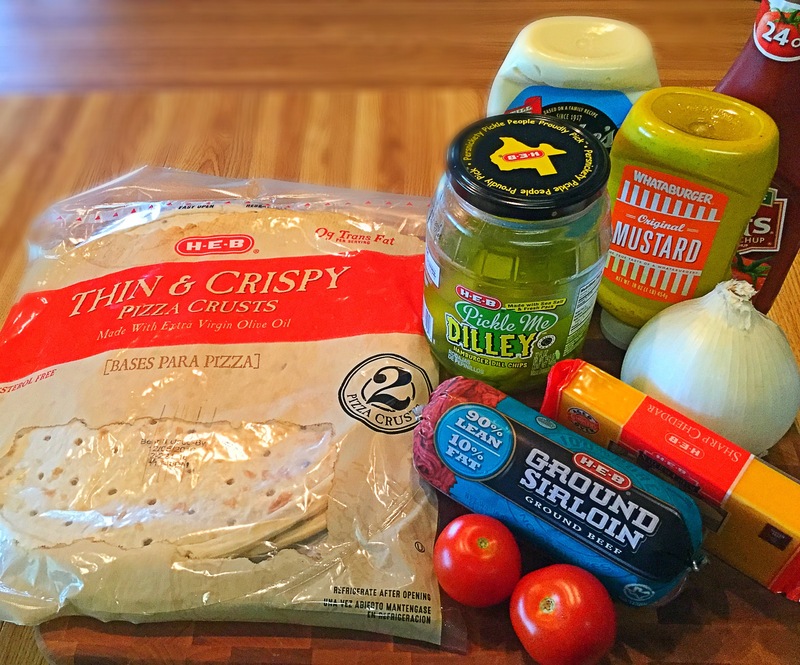 Begin this super quick and flavorful dinner by heating up the cooking oil to fry up your tortillas. I used my deep fryer, but if you do not have one you can fill a large heavy bottomed pan or dutch oven with a couple inches of oil. While the oil is heating up, whisk together the spices and toss with the shrimp and extra virgin olive oil. Cover and set aside. Using tongs, carefully place 1-2 tortillas into the hot oil and allow to crisp up. Generally just 2-3 minutes; you can flip over after a minute or two if needed. 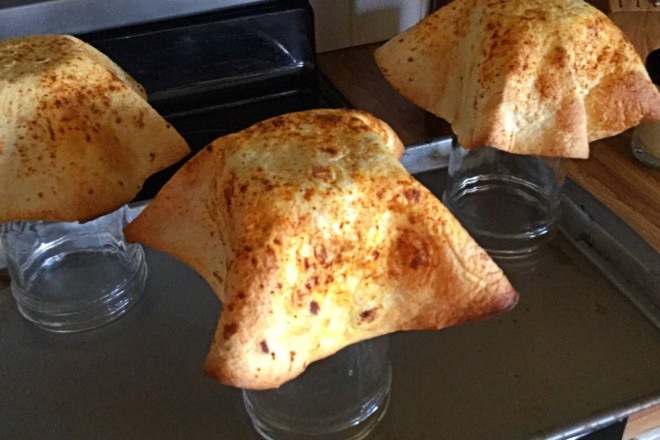 Set aside on a paper towel lined plate. Also, heat up those beans! Now either on the stove top or hey, even your grill, we’ll cook up those shrimp!! These go fast, again just 3-4 minutes. Assembly time! Quick meal right?? On each tostada shell, spread on a layer of beans followed by a layer of your guacamole. 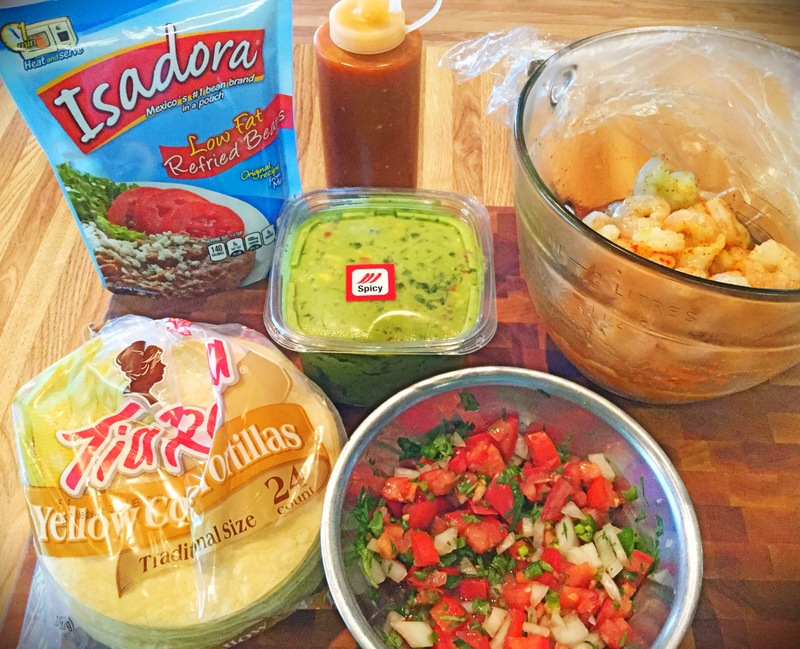 Next top with a few of the spicy shrimp (the guac helps them to stay on) and the pico de gallo. I like to serve with some Mexican hot sauce, lime wedges and a cerveza! Enjoy! I’m lightening it up and fancy’ing it up (I realize that’s not real a word..but it works!)! 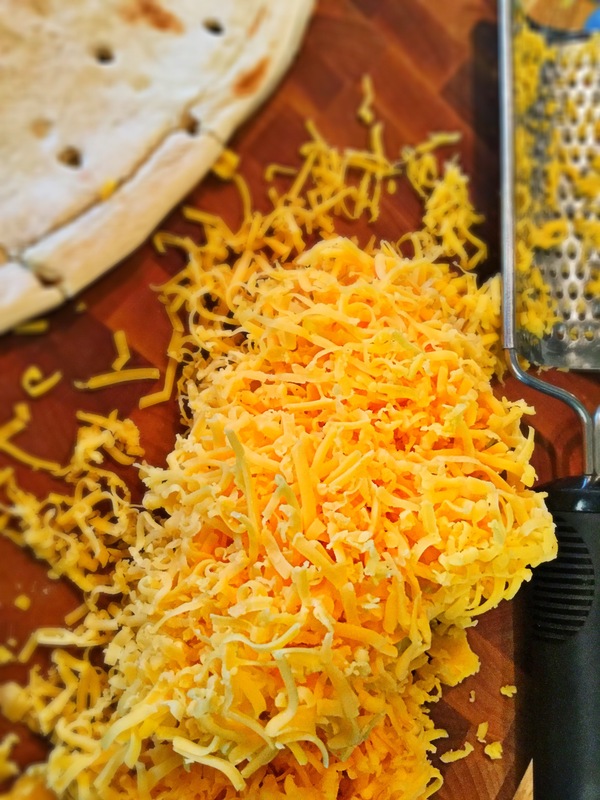 No despite the glamorous sounding name to this recipe, it’s actually super easy and quick! I honestly say that this can be made in well under 30 minutes. It has so much flavor, so much FRESH flavor to be exact. You get in fruit, veggies and protein here and zero guilt or that yucky “I’m stuffed” feeling. Which is why I pair mine with a crisp glass of vino..I mean c’mon! I have to have a little naughtiness! *Balsamic Glaze: it’s not to be confused with “balsamic vinegar”. This is a thicker, syrup-like glaze with a slightly sweet finish. 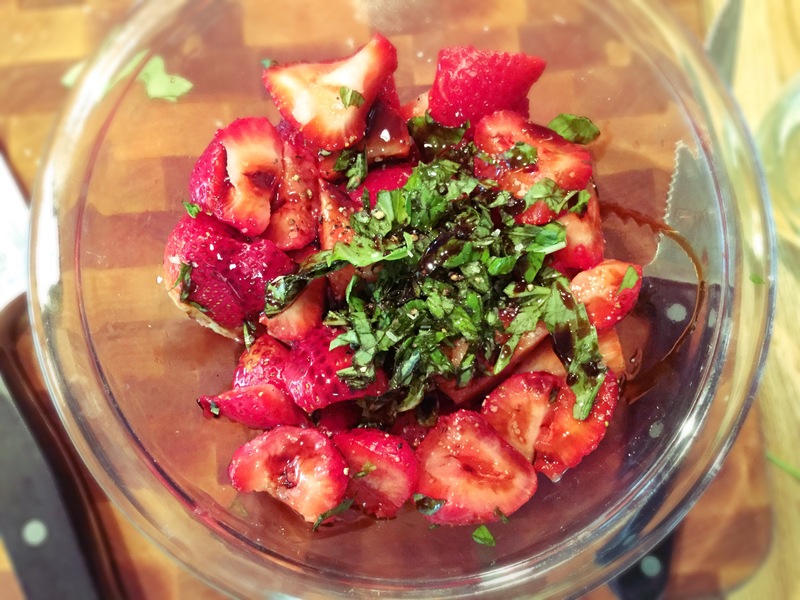 We’ll start this light and tasty recipe by cleaning and quartering the strawberries and chopping up the garlic and basil..or be fancy and do a chiffonade 😉 Next combine the fresh basil to the strawberries and 1 tbsp each of extra virgin olive oil and the balsamic glaze, gently toss together. Cover and set aside. 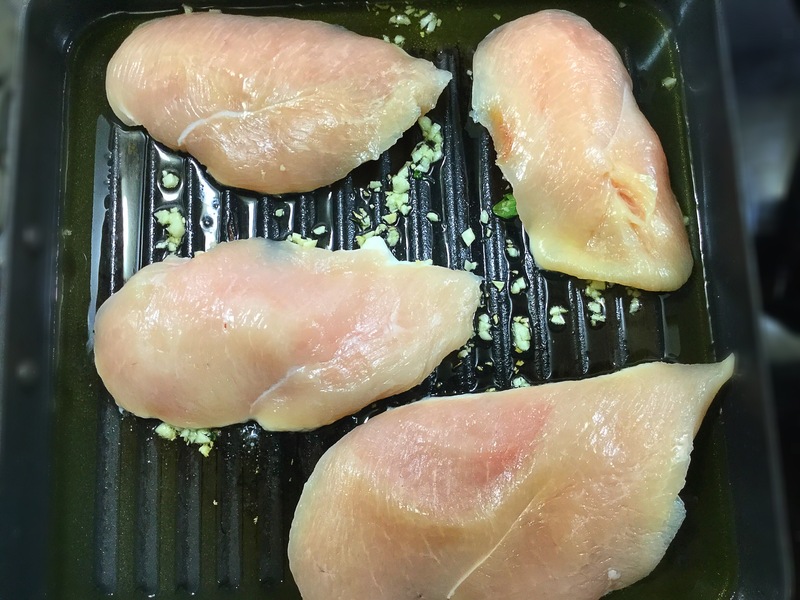 Next, heat up either your grill or a grill pan with a couple Tbsp’s of olive oil on your stovetop to medium-high heat. Generously season the chicken cutlets with salt, pepper and the minced garlic and place on grill/pan. Cook for approximately 4 minutes per side, till cooked through and beautiful golden brown grill marks appear. Set aside. Now that the chicken is done, it’s time for our lettuce! 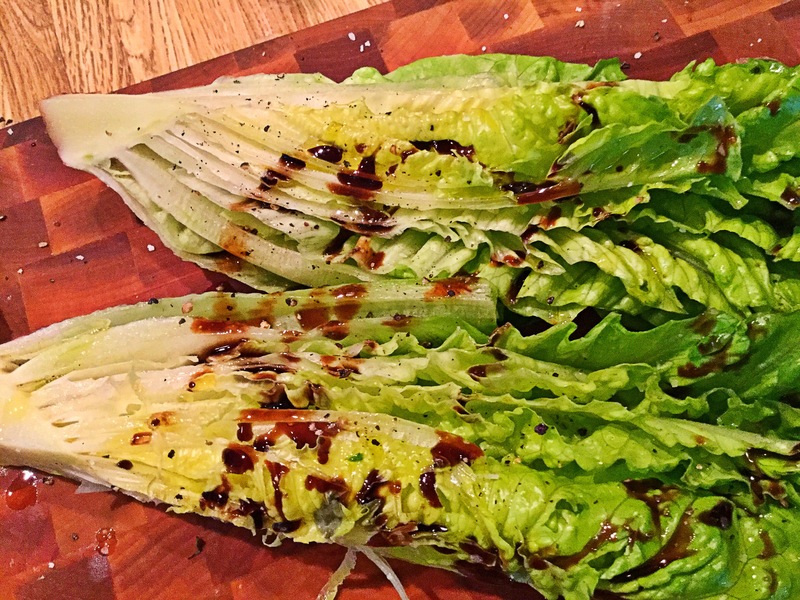 To each quartered piece of romaine, drizzle a bit of evoo, balsamic glaze and a generous sprinkle of salt & pepper. 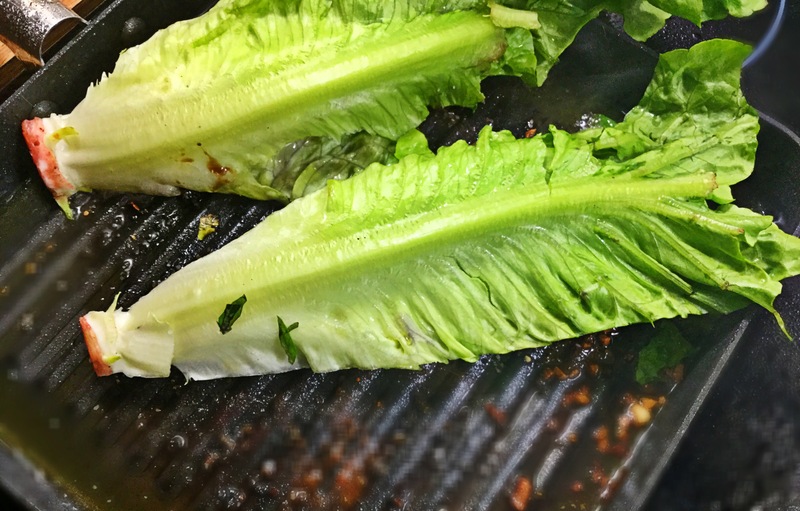 Place ‘face-down’ onto the grill pan and let the grill make those fantastic char marks. To serve!! 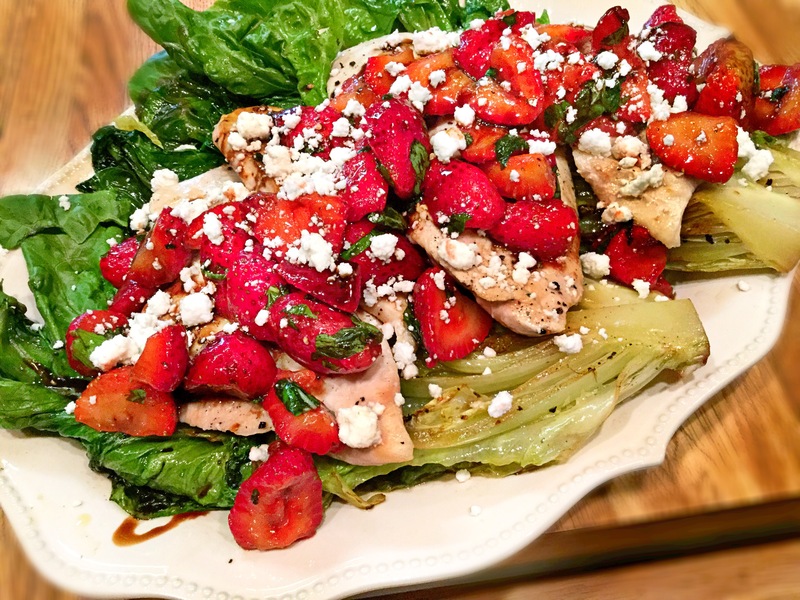 On a large family style platter (or individual plates), lay down the grilled romaine and top with the chicken cutlets. 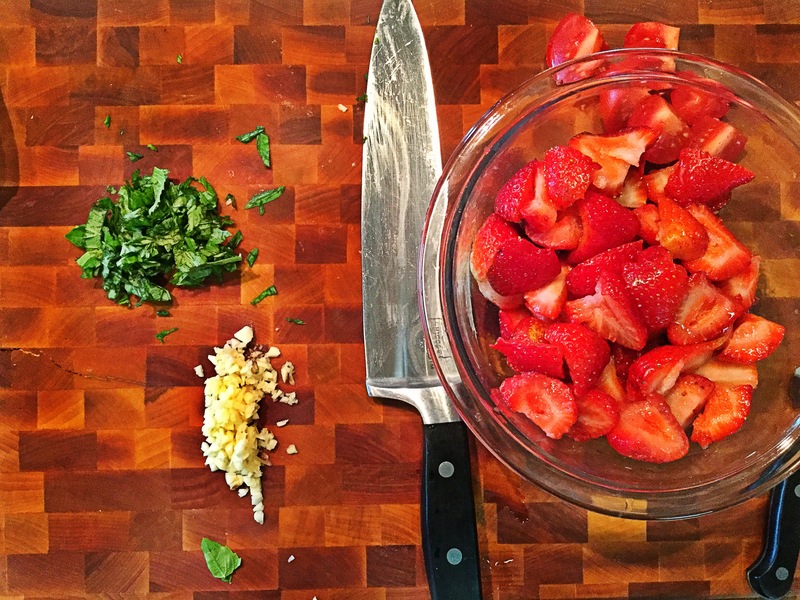 Spoon the strawberry-basil mixture all over top and sprinkle on the goat cheese crumbles! I also like to add another drizzle of that sweet balsamic glaze over top and another pinch of kosher salt & pepper. Enjoy!! I love Mexican food. Seriously, truer words have never been spoken. So, like every morning, I woke up craving just that! 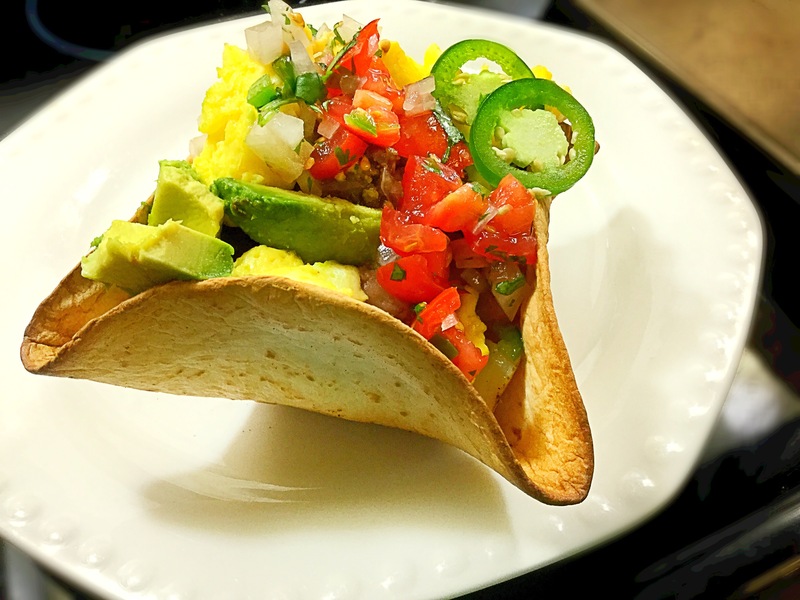 Now instead of the usual breakfast burrito, the typical Texas breakfast taco or the fancier heuvos ranchero and chilaquiles, I thought “what about a taco salad??? But a breakfast version??! !” Genius..Ill let you say it. I know I did. *I did not put exact amounts for the ingredients, as it depends how many bowls you are making. I made 4 bowls with the below pictured ingredients. 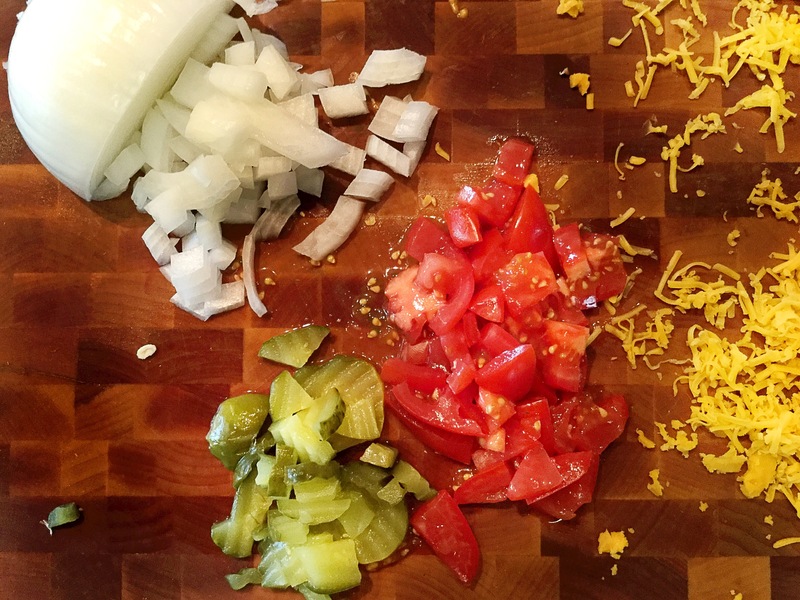 **Pico de Gallo: Diced tomato, white onion, jalapeño, cilantro, fresh lime juice and a pinch of salt. 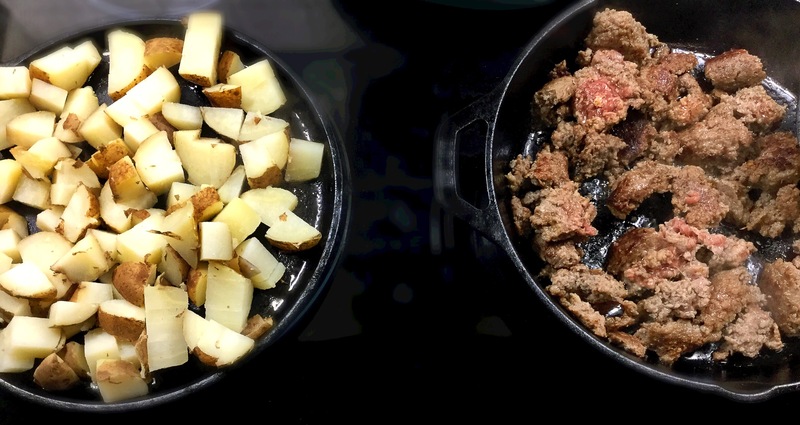 To make perfect restaurant style breakfast potatoes/home fries: Either bake the potato first OR quarter each potato and add to a large pot of salted water. Bring to a boil, cover and simmer. Once just fork tender (not too soft here), remove from the pot and allow to cool slightly. Once cool enough to touch, cube up! Preheat the oven to 400 degrees. 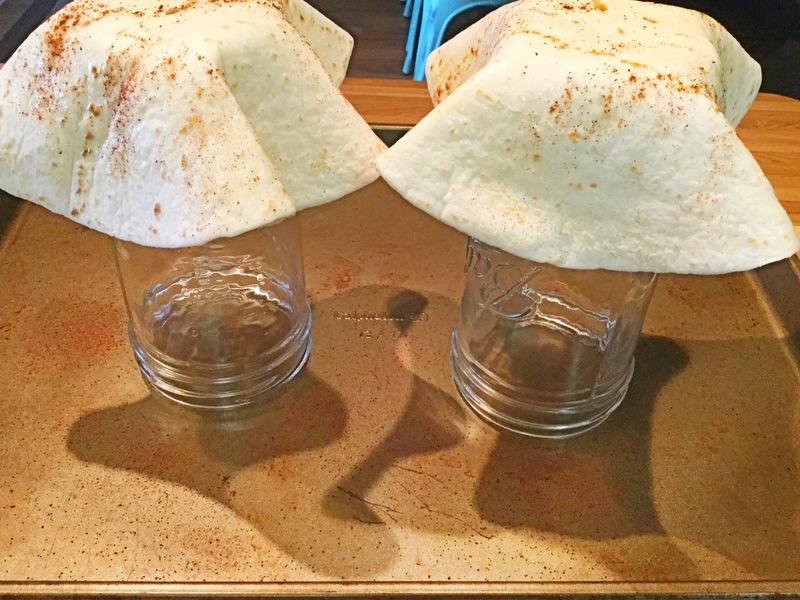 Place mason jars upside down on a baking sheet or large crumpled balls of foil, etc. 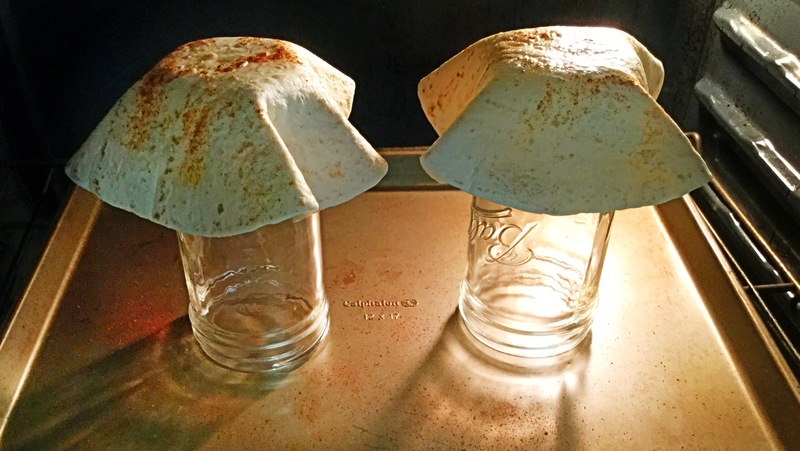 Microwave the tortillas for 30 seconds to make pliable and drape over the mason jar. Lightly coat in cooking spray and sprinkle on the cumin and chili powder for a nice flavor and color! Bake the tortillas for 8-10 minutes, watch closely as not to burn, but I like a few “charred” edges myself..rustic! Allow to cool for a few minutes, pull off the jar and get ready to fill! In the other pan, add the par-cooked, cubed potatoes in an even layer. Let them cook people! Do not keep stirring around, this allows them to build that golden brown restaurant crust on them! After so many minutes, flip to get the other sides of the potatoes nice and crispy! Once the potatoes and sausage are about finished, beat the eggs with a bit of milk, salt & pepper. Cook, scrambled, with a tbsp of butter. Assembly time! 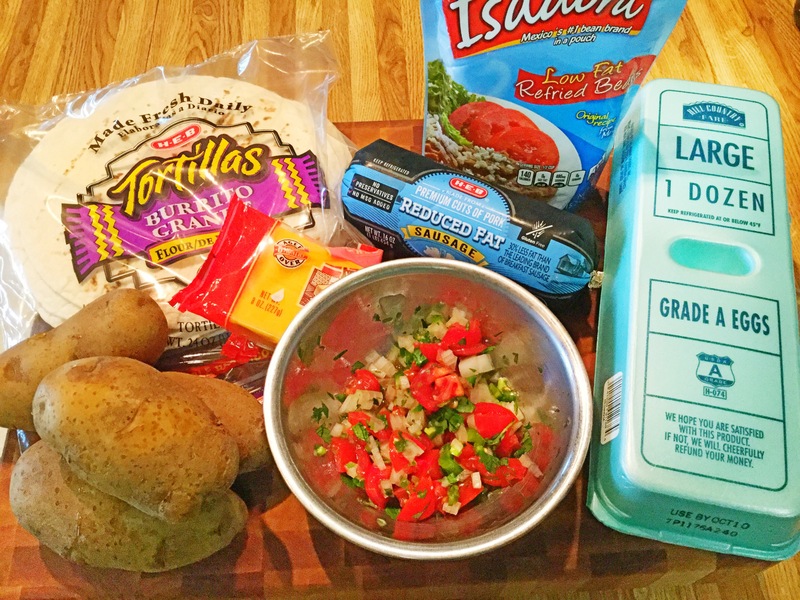 Super simple here folks…take your baked tortilla bowl and fill away! I like to go this route: beans, potatoes, sausage and then eggs! Top with some fresh pico de gallo, avocado slices, jalapeño slices and a few dashes of hot sauce! Enjoy!! Pizza? Burger? Pizza? Burger?? How about both!! Yep, this is such a fun take on everyone’s top two favorites! So my boys were ‘arguing’ over what to have for dinner the other night. 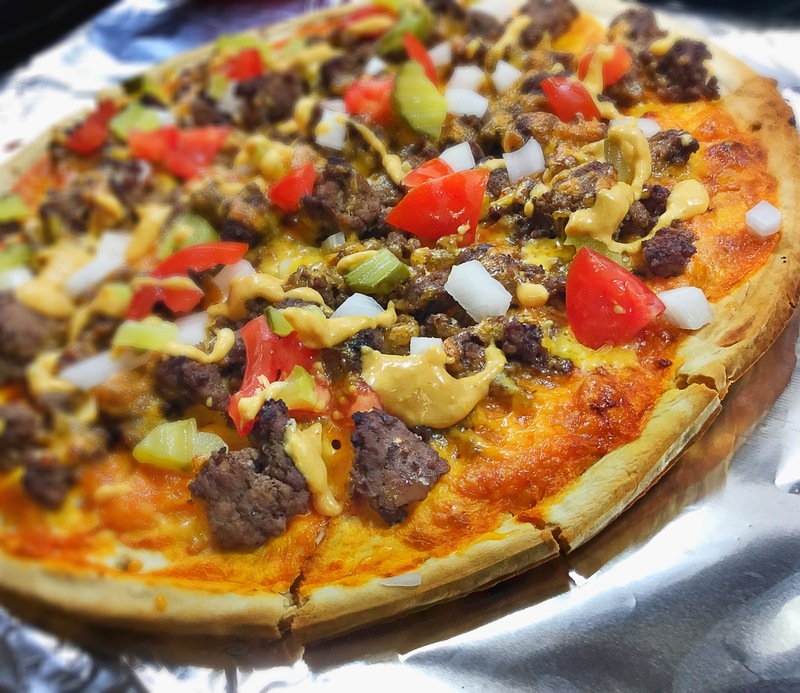 In true Parker fashion, he wanted pizza (hey it’s better than his other favorite, PB&J!) and just like I knew Brooks would, he voted for cheeseburgers. Momma moment!! Let’s combine the two and have a happy family all around..and again, no PB&J sandwiches. How easy is this you ask…For one, it’s done in under 30 minutes. Two, both kids and adults love it. Three, you likely have the majority of the ingredients on hand already!! Please give it a try this week! 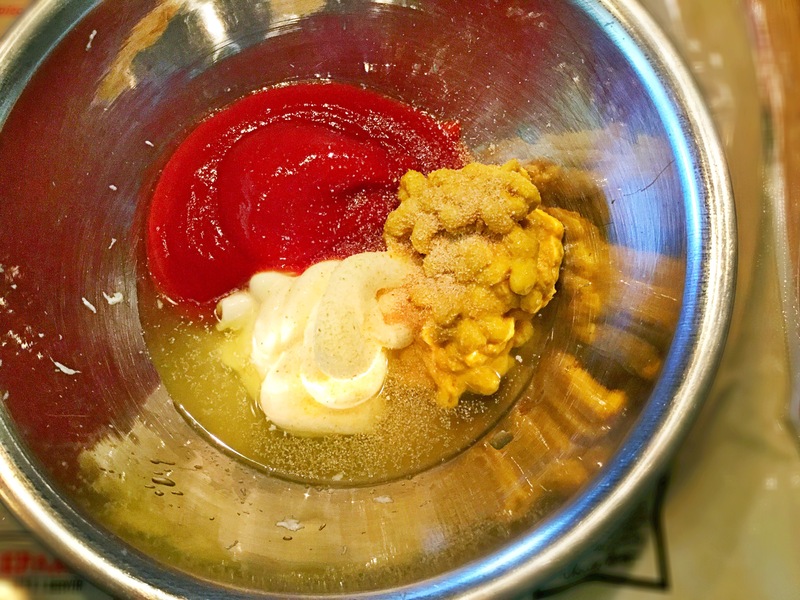 In a small bowl combine the ketchup, mayo, mustard, onion powder and dill pickle juice. 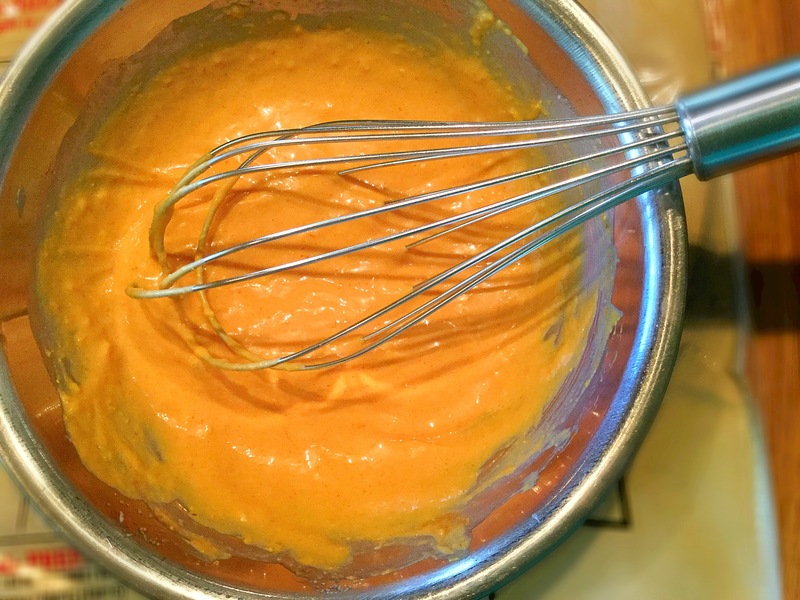 Whisk together till smooth, taste and tweak to your liking. Cover and set aside. Also make sure to bake the pizza crust according to package directions. *I typically undercook the crust just a couple minutes, you will be placing this back into the oven. 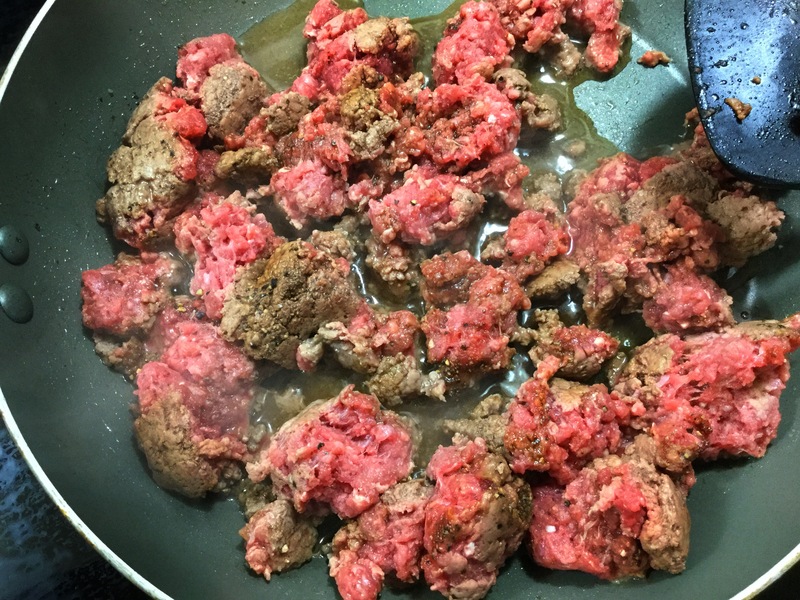 Next, simply brown the ground beef, season simply with salt, pepper and maybe a couple dashes of Worcestershire. Now for the fun part! Take the ‘dressing’ you made earlier and spread it out all over the pizza crust, this acts as your pizza sauce! 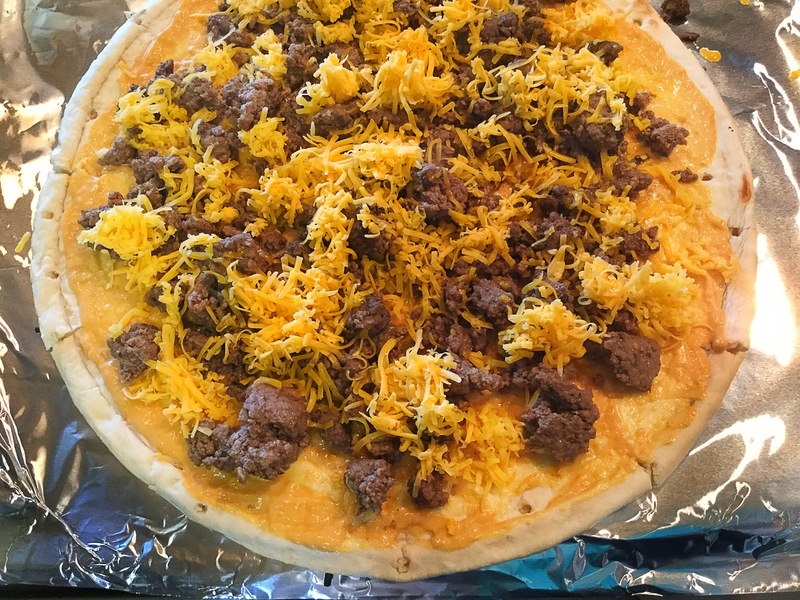 Yummmm….Follow that with the cooked ground beef and shredded cheddar. Place back into the oven until warmed though and cheese is melted. Remove from the oven and top with the tomatoes, onions, pickles and an extra drizzle of that tangy dressing!! Dig in! It’s a rainy day here in Texas. A glorious, cool, rolling thunder sort of day, perhaps my very favorite kind of day there is. 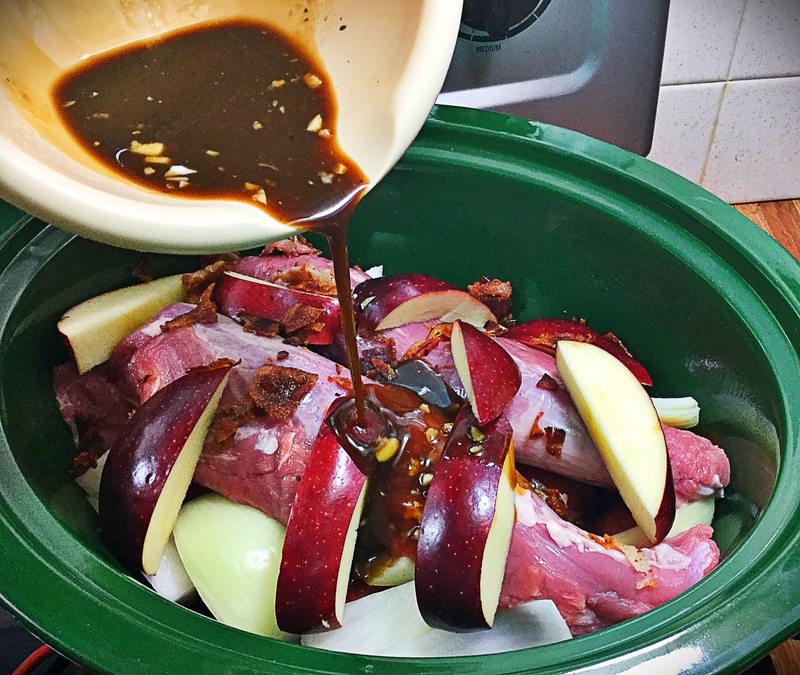 Now rainy days (or any day really) make me want to bake, broil and roast in my kitchen for as long as humanly possible…but there’s just something about that slow-cooker on making the home smell of divine aromas! So that is exactly what I chose to use on this puddle jumping day! Let me tell you, I chose to walk outside numerous times just so I could return in to that smell of tenderloin, bacon, maple and apples. I mean really?? What screams comfort and Fall more than that?! We will begin by spraying your crockpot with a bit of non-stick spray, rinsing and chopping your produce and cooking the bacon. 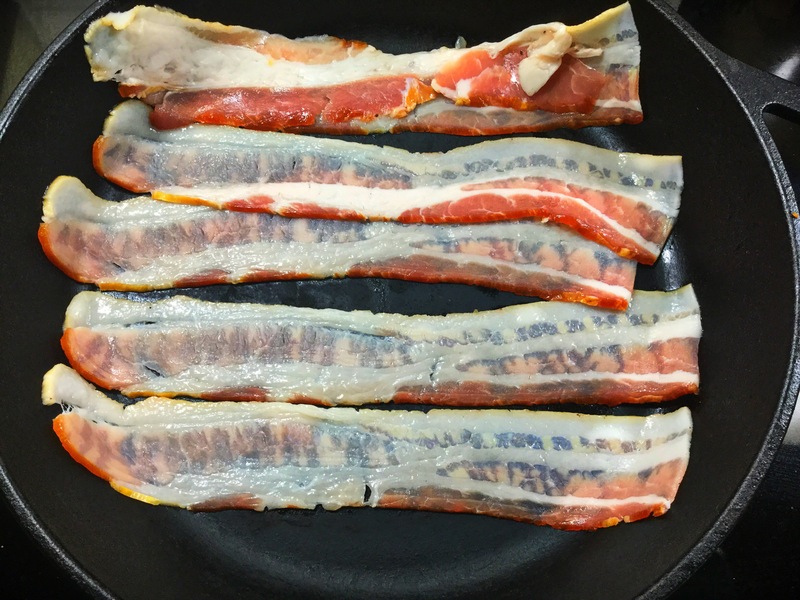 Once bacon has crisped, remove from pan and rough chop. 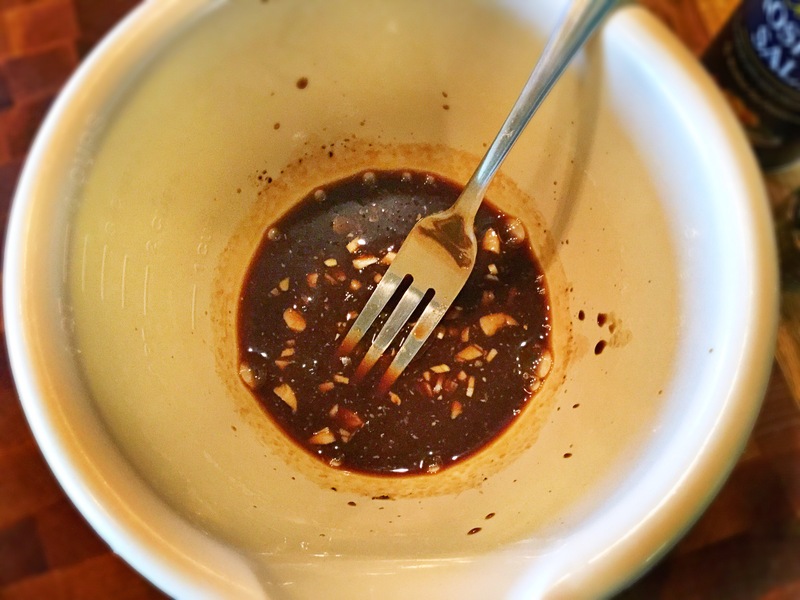 In a small bowl, whisk together the maple syrup, balsamic, Dijon, soy sauce and minced garlic. Next, place the onions, carrots and potatoes in the crockpot followed by the pork tenderloin(s). 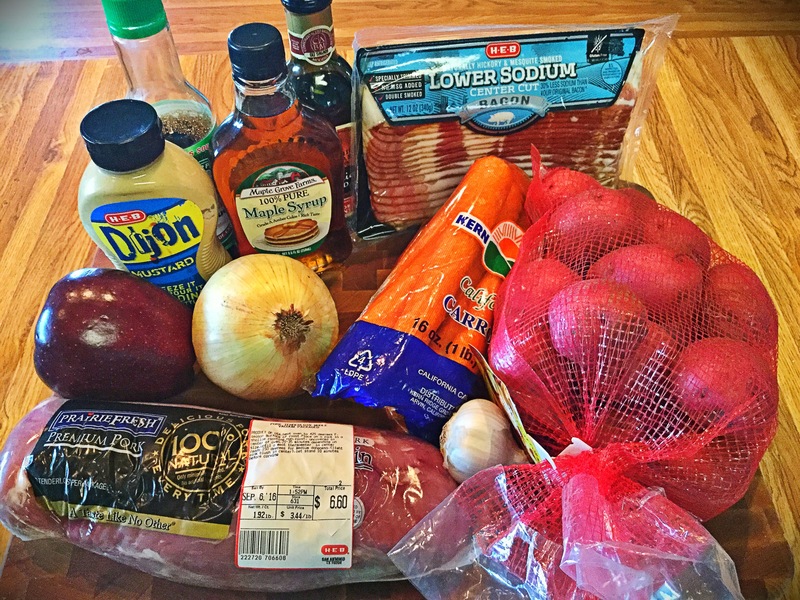 Pour the maple glaze over top and then toss on the apple slices and chopped, cooked bacon.